The internationally-sanctioned, professional cycling stage race known as "America's Toughest Stage Race" just got distinctly tougher. Organizers of the Larry H. Miller Tour of Utah revealed today that this year's event, August 7-12, will increase the overall mileage from 409 miles to 545 miles of racing over six days. New and refreshed courses along the Wasatch Front will provide 37,500 vertical feet of climbing, including a new road race on the final day in Park City via the summit of Empire Pass. "'Tough' really is the quintessential word for the Tour of Utah this year. The reconfigured course will really test the best cyclists in the world. And it's going to be unbelievably exciting for fans - from the enormous crowds we expect at all the host venues and at all the King of the Mountain climbs, to the worldwide audience we anticipate with live coverage on both FOX Sports Network and Tour Tracker," said Steve Miller, president of the Tour of Utah. "The Tour of Utah is very important for American cycling. It's billed as 'America's Toughest Stage Race,' and I believe the courses reflect that. We have some very difficult climbs, especially this coming year. There are a couple of new ones that will really shock people," added Levi Leipheimer, the two-time defending Tour of Utah champion and a stage winner at the Tour de France, who now rides for Omega Pharma - Quick-Step out of Belgium. The team has recently accepted an invitation to race at the Tour of Utah for the first time. "The geography in Utah is very unique. I've been all around the world and you just don't find the high mountains, and the desert, and the red rocks, and the aspen trees and the Great Salt Lake. It's all very unique and definitely worth a trip." FOX Sports Network will provide 12 hours of live coverage during the six-day event, two hours each day, and a total of 18 hours of programming. FSN's national network reaches 85 million households, with viewers in Utah accessing the race on ROOT Sports. Each stage is scheduled to finish just prior to 4 p.m. MT, which allow for the live FSN broadcast to capture stage results and awards presentations. The start times will vary, and will be posted to the Tour web site. Race week for the 2012 Tour of Utah begins with Stage One on Tuesday, August 7 with a 131.6-mile (211 kilometer) road race in Ogden. This is the first time since 2008 that the Tour has started with a road race rather than a Prologue. Historic 25th Street in downtown Ogden will mark the start and finish for the road race at Kiesel Avenue. Cyclists will climb through Ogden Canyon en route to Morgan County's lush ranchlands, reservoirs and canyons. There will be a total of four Ski Utah KOM climbs on this opening stage of 8,900 feet of elevation gain, including a new climb over Hogback Summit. Sprint Lines will be located in Morgan and Huntsville. On the return to Ogden, the peloton will crest the infamous Trapper's Loop en route to crossing North Ogden Pass from the back side, a two-mile climb with nine percent average gradient. Stage Two is the inaugural Team Time Trial on Wednesday, August 8 for the Tour of Utah. This will be held at Miller Motorsports Park in Tooele. It is the fifth consecutive year this "race of truth" will be contested at this state-of-the-art road racing facility, which was completed in 2006 for automobiles, motorcycles and karts. This year's route is 13.5 miles (21.75 kilometers) in length, slightly longer than last year's individual race against the clock. The start/finish line will again be adjacent to pit row. This year's Team Time Trial is significant, as it is the only major stage race in North America to offer this team event. Whereas the individual time trial calls for athletes to compete one at a time on the course, the team time trial requires all members of each team to race together. The time of the fifth rider crossing the finish line will be the time recorded to all members of the team. Thursday, August 9 is Stage Three presented by University of Utah Health Care. The peloton covers 86.1 miles (138 kilometers) from Ogden to Salt Lake City, with 7,134 feet in elevation gain. There are two sprint lines (Huntsville and Morgan) and three KOMs. After climbing North Ogden Pass for a second time in three days, riders will pass Snowbasin Resort, site of various world championship skiing events, and East Canyon State Park, with its scenic reservoir. Additional climbs include the front side of Trapper's Loop and a four-mile ascent of Big Mountain. This is a similar finish used two other times by the Tour of Utah to reach the finish line at University of Utahs Research Park, on the east hillside of downtown Salt Lake City. Saturday, August 10 is the showcase "Queen Stage" of the Tour of Utah, Stage Five presented by Exergy Development Group. 2012 marks the fifth consecutive year for a slightly-modified 102.6 mile (165 kilometer) climb-fest from Newpark Town Center in Park City to Snowbird Ski and Summer Resort. It features four King of the Mountain climbs and a total of 10,000 vertical feet of elevation gain. New this year is the opportunity for recreational cyclists to ride all or part of the same course, on the same day, as the professionals in The Ultimate Challenge. Registration is required for the amateurs, ranging from $95-$105. The shorter options of 35 miles to Heber and 74 miles to Alpine provide viewing opportunities for race fans at the two sprint lines for the stage. A third sprint line will be contested in Kamas early in the stage. The Larry H. Miller Tour of Utah continues to be free to all spectators, making professional cycling one of the most unique pro sports in the world today. 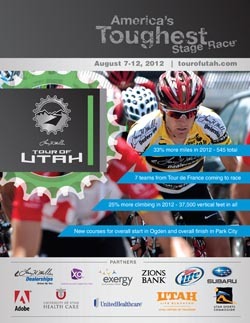 Information about teams, Experience Packages, The Ultimate Challenge and more can be found by visiting www.tourofutah.com, with updates on Facebook, Twitter, and YouTube. The Larry H. Miller Tour of Utah is a six-day, professional bicycle stage race along the Rocky Mountain's Wasatch Range. Known as "America's Toughest Stage Race", the race covers 545 miles of racing through some of Utah's most beautiful and challenging terrain. Now in its eighth year, the Tour of Utah is scheduled to take place August 7-12 as a UCI 2.1-sanctioned stage race for the best professional cyclists in the world. The event is owned and operated by the Utah Cycling Partnership. Larry H. Miller Group of Companies continues as the title sponsor.